^ THQ Unveils First Person-Shooter Metro 2033. THQ. Business Wire. 22 October 2009 [2010-01-09]. ^ 4A Games announces its partnership with Dmitry Glukhovsky (Adobe Flash). 4A Games. 30 March 2006 [2010-01-09]. 4A Games announces its partnership with Dmitry Glukhovskiy, the author of the cult postnuclear novel "Metro 2033" […] he will help create a game based on his novel, writing of its scenario, and working on its concept as an integral part of the 4A Games team. ^ 4A Games at Games Convention (Adobe Flash). 4A Games. 9 August 2009 [2010-01-09]. 4A Games is ready to announce our first project which will appear on Games Convention in Leipzig! During the Exposition we will have an exclusive showcase of our product, codename "Metro 2033. The Last Refuge". ^ GC 2006 Trailer. 4A Games. 30 August 2009 [2010-01-09]. ^ Metro 2033 (pc) reviews at Metacritic.com. [2010-03-20]. ^ Metro 2033 (xbox360) reviews at Metacritic.com. [2010-03-20]. 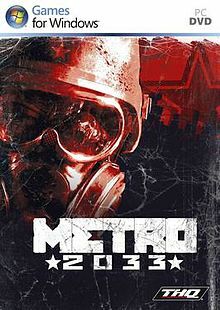 ^ Metro 2033 Review for the PC, Xbox 360 from 1UP.com. 2010-03-22 [2010-03-23]. ^ Watters, Chris. Metro 2033 Review. GameSpot. 2010-03-17 [2010-03-18]. （原始內容存檔於2010-11-26）. ^ Metro Metro: Redux release date announced. ign.com. 2014-06-24 [2014-08-07].